Every Tuesday and Saturday, pregnancy evangelism opportunities abound in Bakersfield outside the Family Planning Associates abortion chamber at 25th & H. For more information call (661) 706-2229. For information on bringing Terri or Tim Palmquist to speak, sing, or present a pro-life seminar for your group, click here. winner of the 2008 "Comida del Cielo" award! 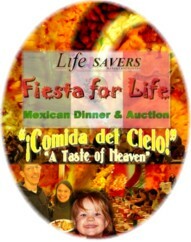 El Adobe's cheese enchiladas were voted as the favorite entree by attendees at the 2008 Fiesta for Life Mexican Dinner and Auction.